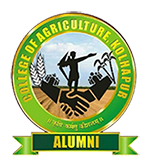 Extension wing of the College of Agriculture, Kolhapur established in 1963-64 is an integral part of the college which performs all the three functions viz., teaching, research and extension education. The college development block was attached to extension wing in the year 1968. Previously it had 62 villages from Karveer tahshil of Kolhapur district and divided into eight circles, where eight Agricultural Assistants are placed to disseminate the agricultural technology to farmers. The extension programmes in the college development block are planned and implemented under the guidance and the directives of the Professor of Extension Education. The block serves as a laboratory for providing scientific and supervised training in the subject of Agricultural Extension to the students of the College of Agriculture, Kolhapur. To serve as an Extension Education laboratory to the under graduate and Post Graduate students. To test the Technology generated by the university on the farmers field by using various extension teaching methods and programmes. To provide the improved seeds of paddy, sorghum, wheat, gram, soybean, nagali etc. and grafts of important fruit crops on No Profit No Loss basis. To help the farmers, women and rural youths for entrepreneurship development in dairy, poultry, goat, fruit processing etc. to uplift their socio- economic status. To provide feedback to the university scientists. The Agricultural Assistants posted in different circles assess the needs of the community from the activities like method demonstration, result demonstration, farmers rally, group discussion, training on IPM, field visits, farm and home visits etc. The recommendation of research sub section of this wing also assesses needs of community. No Seed Kg No. Bene. Every year, nearly 10 to 15 thousand farmers, students and officers are visiting College of Agriculture, Kolhapur. The extension department organizes visits and provides the information of different research projects to the visitors. Radio talks and Television interviews on different subjects are delivered by the Professors. The farmers in Kolhapur Region are benefited regarding improved agricultural technology introduced by Mahatma Phule Krishi Vidyapeeth, Rahuri. Also, the problems regarding pests and diseases of crops, animal disease, soil problems, and introduction of improved varieties, problems of fruit orchards and vegetables, etc. through bio control and impact of IPM practices are resolved. Professor of Extension Education acted as Co-ordinator for RAWE Programme since 2007-08. The Subject Matter Specialists of RAWE attend monthly meetings, group discussions, farmers’ rallies and guide the students and farmers of their respective RAWE centers. The details of extension activities carried out by 210 students (avg.) every year of Rural Agricultural Work Experience (RAWE) Programme during 2013-14 to 2017-18 is given table. 21 Animal Vaccination Camp 7 No. No Seed Kg No. Bene. Seed Kg No. Bene. Seed Kg No. Bene Seed Kg No. Bene Seed Kg No. Bene. Seed Kg No. Bene. No. Bene. No. Bene. No. Bene. No. Bene. No. Bene. No. Bene. 21 Animal Vaccination Camp - - - - 3 No - 2 No. - 2 80 7 No.